The Ohio Valley ReSource, a regional journalism collaborative reporting on economic and social change in Kentucky, Ohio, and West Virginia, published a story drawing attention to a recent statement by the National Coalition of Black Lung Respiratory Disease Clinics calling on federal regulators to enact a standard to control the dust generated when mining equipment cuts into rock containing silica, or quartz. The story expands on coverage by National Public Radio and Frontline highlighting the surge in silica-related disease in underground coal mines. While the focus of the journalistic reporting has focused on coal, the implications for metal and nonmetal mining are far from clear. The current MSHA permissible exposure limit for quartz is essentially one-half of the one adopted in 2016 by OSHA for the general industry, construction and maritime sectors. Current MSHA regulations also lack the stringent ancillary provisions addressing exposure monitoring and medical surveillance incorporated in the OSHA rule. The Ohio Valley ReSource story goes on to cite statements by Assistant Secretary David Zatezalo during a recent MSHA stakeholder meeting and those of Rep. Bobby Scott, Chairman of the House Education and Labor Committee, regarding hearings that may presage legislative solutions. The Ohio Valley ReSource story can be accessed through the following link: http://ohiovalleyresource.org/2019/01/28/black-lung-clinics-call-for-action-but-top-regulator-plans-no-new-measures/. The Mine Safety and Health Administration (MSHA) announced that an improved version of the Mine Data Retrieval System (MDRS) is now available for your review on MSHA.gov. Participants in the IMA-NA/MSHA Alliance meeting last week had an opportunity to preview the beta version of the site before it was publicly announced today. We were advised that an instruction manual, of sorts, is available on the MDRS website, so you can learn to access and utilize the full capabilities of the improved system. Please send your comments to webhelp@dol.gov. MSHA will continue to offer the original version of the MDRS along with our new version until September 7, 2018, while it compiles and responds to your feedback. MSHA published its revised final "Examinations of Working Places in Metal and Nonmetal Mines" rule in today's Federal Register. This final action amends a rule MSHA issued in January 2017. A competent person examines each working place for adverse conditions. The working place must be examined at least once each shift, before work begins or as miners begin work in that place. The operator must initiate appropriate corrective action. The operator must promptly notify miners in the affected area if the adverse conditions are not corrected before miners are potentially exposed. The operator must withdraw all persons from the affected area if the adverse condition may present an imminent danger. The date when the described condition is corrected. The operator must make the record available to MSHA and the miners’ representatives. MSHA will hold a series of six public meetings around the country to inform and educate the mining community about the requirements of the final rule. This morning President Trump released his Administration's budget proposal for FY19. The Administration's budget comes on the heels of the passage of Congress's 2-year budget package. President Trump signed the deal into law Friday morning following it's passage late Thursday night. Congress's package raises budget caps by $300 billion in the next two years, increases the debt ceiling and includes nearly $90 billion in disaster relief for hurricane-ravaged Texas, Florida and Puerto Rico. Of the $300 billion, roughly $165 would go to the Pentagon with $131 billion earmarked for non-defense programs. President Trump's budget lays out plans for a $3.6 trillion in deficit reduction over 10 years while simultaneously directing more funding to the Department of Defense. In many ways the FY19 budget proposal is similar to the FY18 proposal. It is interesting to note the Administration is pushing a focus on infrastructure across it's budget proposal, most likely as a way to sync the budget requests up with the infrastructure package. Below are some specific points of interest from the proposal, as each Department holds listening sessions IMA-NA staff will keep you updated on aspects of importance. The Administration is asking for a further reduction of 34% in funding for the EPA. This would cap the Agency's budget at $5.4 billion for FY19. There is an emphasis on water infrastructure programs, to provide clean drinking water and provide necessary updates on wastewater infrastructure. There is an increased focus on cooperative federalism as a way to improve EPA's enforcement efforts. This also includes a return to the EPA's core mission, and the continued defunding of "lower priority programs". The Administration is asking for $9.8 billion for the DOC, which would be an increase of 6% over FY17 enacted funding. There is increased funding for the International Trade Administration to "allow ITA to conduct robust investigations into alleged trade violations, aggressively advocate for U.S. businesses facing tariff and non-tariff barriers abroad, and increase the capacity to closely review proposed foreign investments in U.S. businesses." DOC's focus will continue to be promoting free and fair trade which has been a cornerstone of President Trump's vision for the country. The Administration is asking for $9.4 billion for DOL, a $2.6 billion or 21-percent decrease from the 2017 enacted level. The President is asking for a budget of $376 for MSHA in FY19. The number is consistent with the FY18 request from the Administration. There is a renewed focus on using DOL funding to help move the needle on workforce development. There is $200 million flagged for increasing apprenticeship programs, language to reform Job Corps, and simplify and consolidate existing federal workforce development programs. The Administration is requesting $11.3 billion for DOI, which is a $2.2 billion or 16-percent decrease from the 2017 enacted level. The DOI will continue to focus on the President's call for Energy Dominance, working to manage development of public lands, increase revenues, and streamlining permits. There is a focus on infrastructure in this request, noting that DOI manages an infrastructure portfolio valued at over $300 billion and much of it is in need of maintenance and investment. Secretary Zinke gained the President's support to massively reorganize the Department. The budget asks for $18 million to fund the internal restructuring of DOI. Funding for USGS is being cut by approximately $218 million overall, but the Administration asked for an increase of $11.5 million for the Minerals and Energy Resources Program. The House Subcommittee on Workforce Protections held a hearing on “Reviewing the Policies and Priorities of the Mine Safety and Health Administration (MSHA).” The sole witness was Assistant Secretary of Labor for Mine Safety and Health David G. Zatezalo. Subcommittee Chairman Bradley Byrne (R-AL) stressed that mine safety remains a priority of the Committee on Education and the Workforce, highlighting an interest in examining the regulatory agenda of MSHA and how MSHA intends to work with industry stakeholders to promote policies and practices that protect mine workers and encourage economic growth. His opening remarks can be accessed through this link. Ranking Member Mark Takano (D-CA) observed that this was the first hearing the subcommittee has held on MSHA in approximately 2½ years. He highlighted a recent article in the Journal of the American Medical Association identifying a high incidence of progressive massive fibrosis in patients in Black Lung clinics in southern West Virginia, a theme taken up by other subcommittee Democrats. During his testimony, Assistant Secretary Zatezalo discussed the current state of workplace safety within the mining industry, and how MSHA can strengthen American mining and ensure worker safety. He highlighted a personal interest in addressing recent fatalities associated with powered haulage equipment. His written testimony can be accessed through this link. Happy National Miners Day! 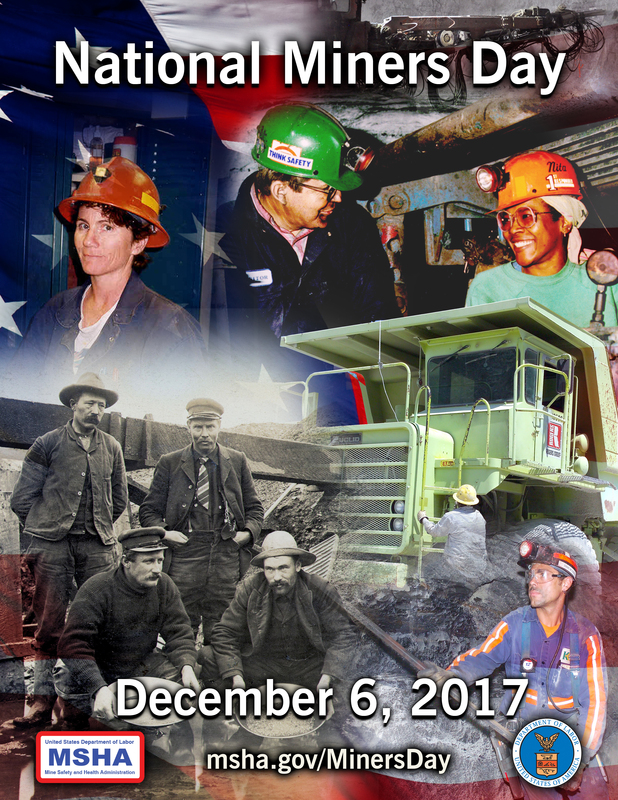 Since its designation by Congress, in 2009, December 6th is a day for the United States to recognize the nearly 300,000 men and women working in the mining industry. IMA-NA is proud to represent the companies and hard working individuals who make up a big piece of the industrial minerals sector. As we all know, industrial minerals are the building blocks of our modern lifestyles. Without the men and women developing and producing industrial minerals, coal, and metals life would look substantially different. We hope that today everyone takes a minute to thank and recognize the tremendous miners we all rely so much on. Remember, if you can't grow it, you have to mine it! To read Secretary Acosta's statement click here. To read Assistant Secretary Zatezalo's statement click here. Today, the Senate voted to confirm David Zatezalo, by a vote of 52-46, as the Assistant Secretary of Labor for Mine Safety and Health. David Zatezalo comes to MSHA from the coal industry, having worked his way up to President and CEO of Rhino Resources before retiring in 2014. This confirmation marks an important step in continuing to full staff the new Administration. As with many of the other Departments and Agencies, the lack of an Assistant Secretary limited MSHA's ability to proactively pursue President Trump's agenda in mine safety and health. IMA-NA is looking forward to working with Assistant Secretary Zatezalo, introducing him to the world of industrial minerals, finding opportunities to promote mine safety and, strengthening the IMA-NA/MSHA Alliance. The confirmation of Assistant Secretary Zatezalo is the second recent confirmation. Last Thursday, the Senate confirmed William Wehrun, by a party line vote of 49-47, to be the Assistant Administrator for EPA’s Office of Air and Radiation. Wehrun is the first EPA Assistant Administrator to make it through the confirmation process. President Trump's nominees for the EPA have been more controversial due to their ties with industry and therefore have been caught up in the confirmation process. At this point there are 5 nominees for important roles within the EPA that still need to be confirmed. IMA-NA is happy to see the Senate confirm two more important positions within the Administration and continue to urge action on the rest of the nominees.